Curious and Co create a space onsite at Camp VC to take a break, reconnect and find balance with a range of massage for all those aches and pains, Reiki workshops, one to one energy healing sessions and tarot readings. Follow @thecuriousandco on instagram to get to know these guys before the event! Ride Yoga is an awesome take on traditional Dynamic yoga classes, that usually focuses on skateboarders, snowboarders and surfers, but this weekend is specifically tailored for you ladies who'd you've been riding your bike all day, skateboarding on the miniramp or dancing your feet off the night before. Ride Yoga classes aim to target specific muscle groups and injury prone areas for riders to improve the strength and flexibility of the body so that you can ride for years to come - on the streets, in the pow or in the waves! Ride Yoga was created Paula Viidu who has spent her whole life on a board, whether it's been skateboarding in London, snowboarding in the Alps or surfing in the Philippines. She also rode a Honda Win from Saigon to Hanoi, so she knows a thing or two about a sore bod from your bike too! 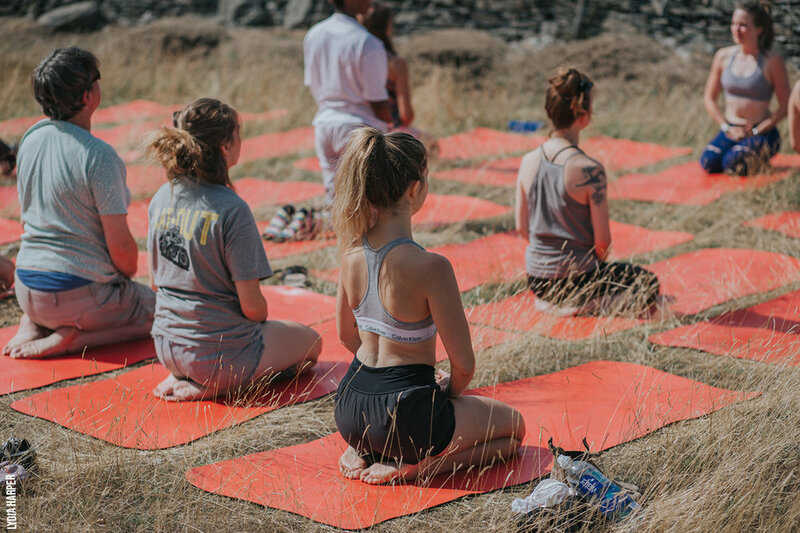 At CAMP VC we love to bring to site new ideas, projects & brands run by incredible women & so for 2018 we are very excited to be partnering up with the amazing Yogi-Bare again for this year to supply our free yoga class with eco friendly mats onsite for you all to use ,crafted from eco biodegradable natural rubber! The brain child of the lovely Kat Pither (adventurer, traveller & Yoga extraordinaire) Yogi Bare is a company born from the of the concept of yoga being for everybody and every body! With a range of incredible yoga kit made from eco friendly selections of materials and alignment with eco conscious values and partnerships with environmental charities Yogi Bare saves your practice at the same time as saving the environment so go check out what they do ahead of getting to site!